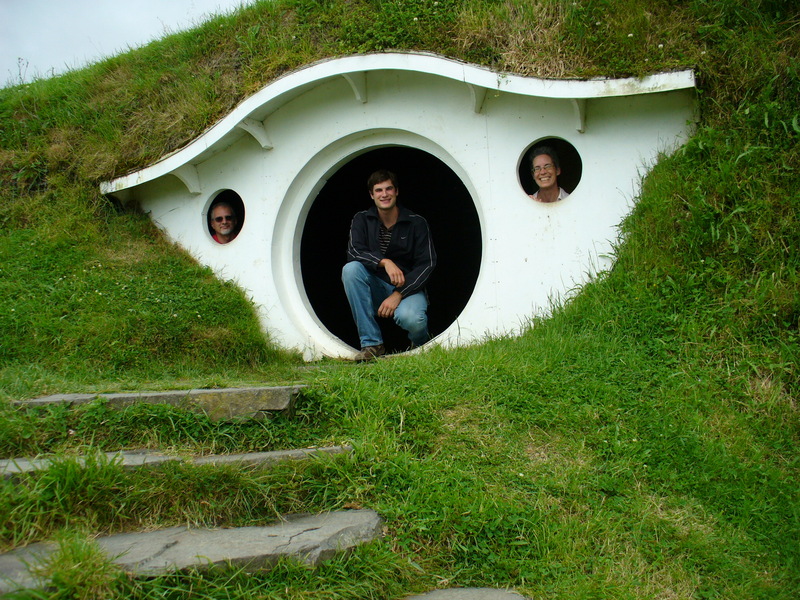 In a hole in the ground there lived a hobbit… | Where have the days gone? 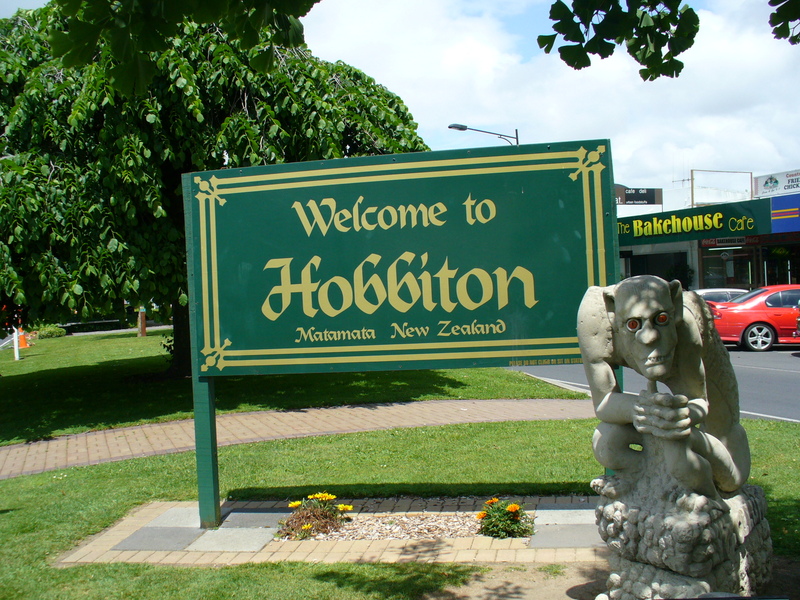 We drove into Matamata (the sign and statue at left are in the center of town), and went to the information center to buy our Hobbiton tour tickets. Alex had found a 10%-off coupon in a magazine I picked up at the airport, so that was helpful. While we waited for the time to gather for the bus, we took the opportunity to walk around Matamata a little bit and do a little gift shopping. We met back at the information center and climbed onto the bus with the rest of the folks who'd bought tickets for that time… a group of Asian tourists, several sets of Germans, some other Americans, and a variety of others. The tour guide explained as we drove, that the Hobbiton set is on a 1200-acre working sheep farm owned by the Alexander family, who continued to work it during filming (just moving the 13,000 sheep around so they wouldn't be caught on film since they were the wrong type for Hobbiton). 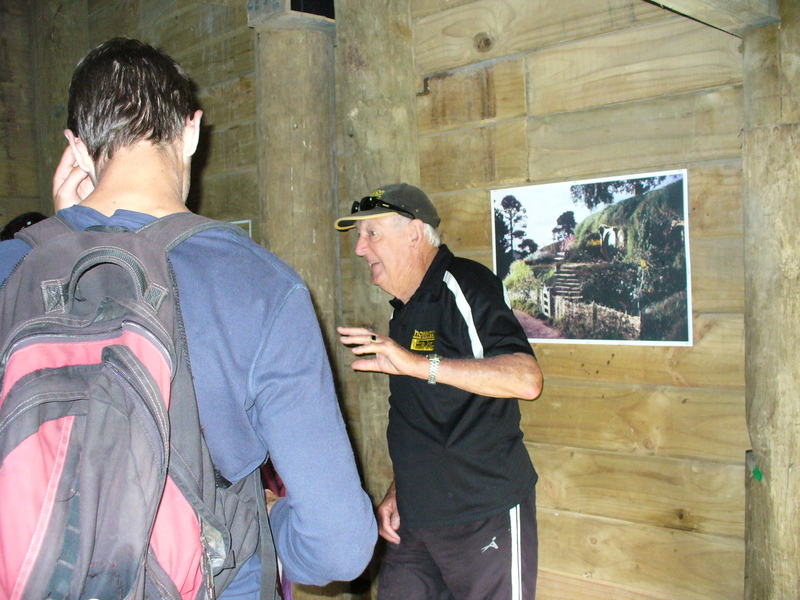 Here is Eric, our very Kiwi guide for the walking tour. He was a little hard to understand at times (heavy accent), but a veritable fount of information about the movie filming. 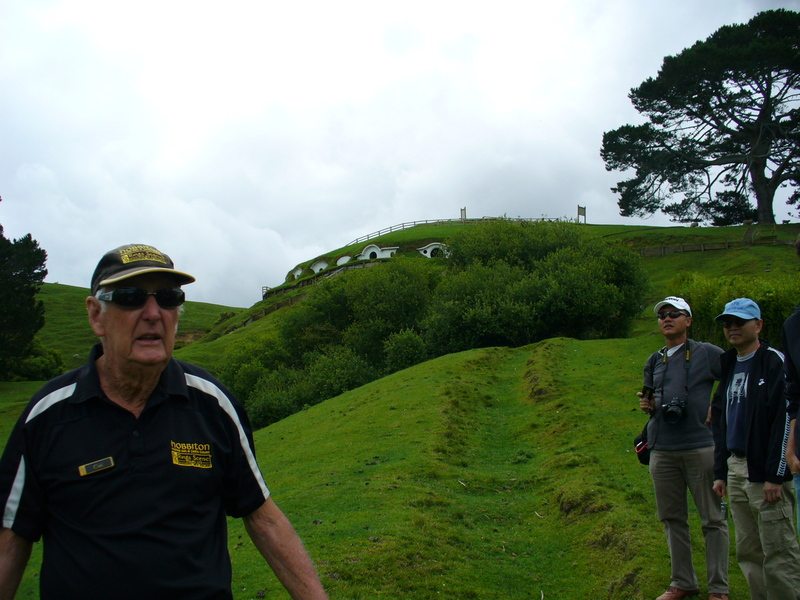 Here, he's showing us the roadway that Gandalf drove up in his cart as he first approached Bag End. He would sometimes stop his explanations to quiz us about arcane LOTR trivia, such as what did Frodo say to Gandalf on this spot? And the thing is, most of the people in the group always knew the answer – it was actually pretty hilarious! 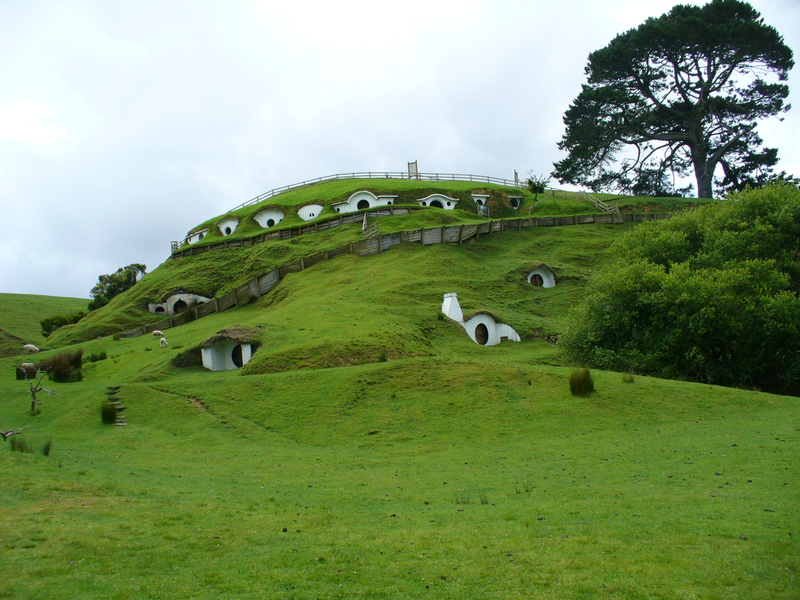 – this is the only Lord of the Rings movie set remaining in New Zealand. After filming, all the sets were required to be destroyed; they began to dismantle this one (presumably last), but then the rains came and the contractor said he'd be back in 6 months. But in the meantime, apparently so many people approached the landowners about seeing Hobbiton, that they were able to convince New Line Cinemas that they should be allowed to give tours, with the proviso that they could not do any reconstruction of the sets. That's why all the remaining holes are just the white substructure… all the pretty fake stones and gardens etc had already been removed. – there have been at least 16 marriage proposals made under the Party Tree during tours. 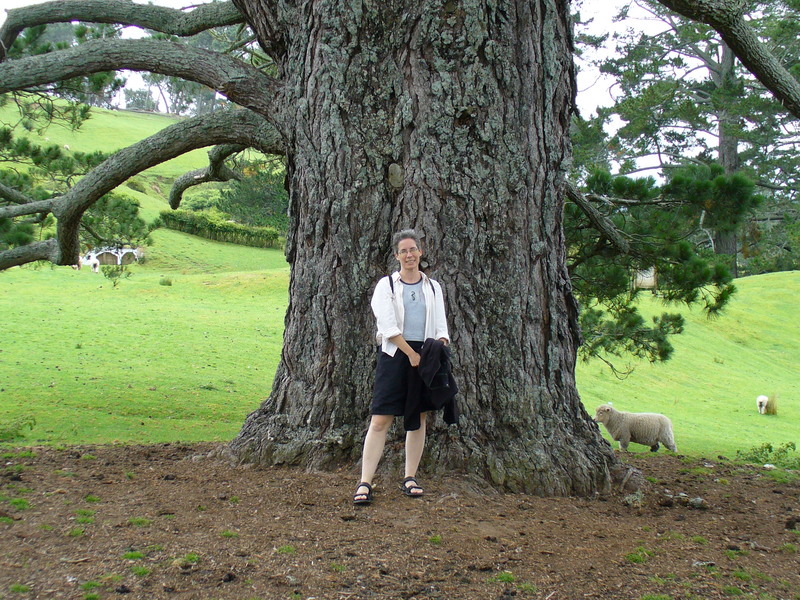 – amazingly, no one in Matamata knew that the Hobbiton set was so nearby. 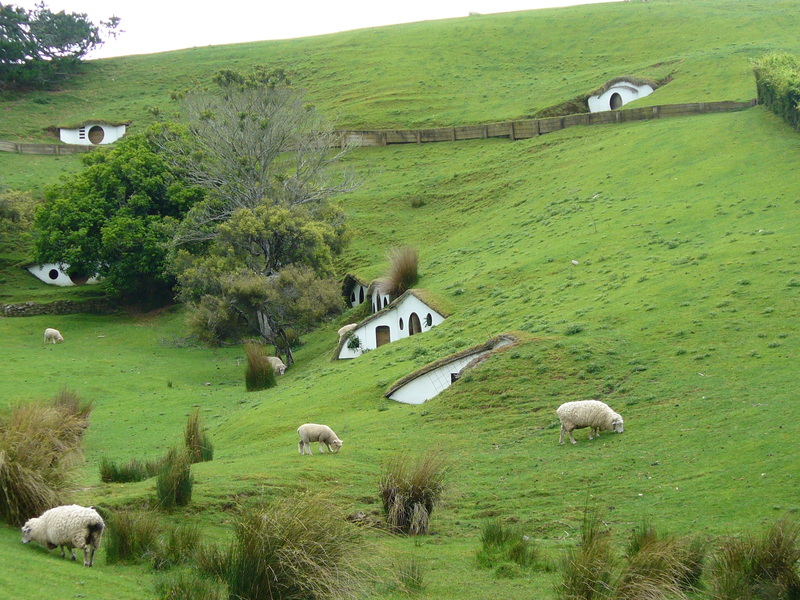 They'd had casting calls for hobbits at the local school, and everyone knew LOTR was filming in NZ generally, but it wasn't until they saw and recognized the farm in the movie that most people knew. All during the filming, the actors were somehow billetted quietly in the area, and all the food etc was somehow brought in and the day's films sent to Wellington, under cover of secrecy. I don't quite buy that story, but Eric stuck to it. 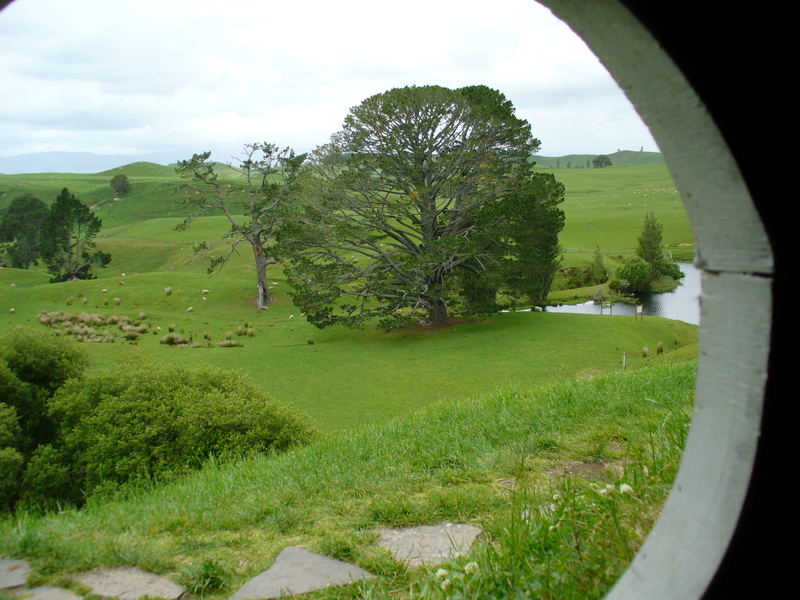 – the Alexander farm was chosen to be Hobbiton during an aerial reconnaissance trip in which they spotted the perfect Party Tree beside a lake in the midst of cropped grassy rolling hills, and no signs of modern civilization within the range of vision. – in another example of trying to be as faithful as possible to descriptions in Tokein's book, for the oak tree atop Bag End, a tree was cut down elsewhere, all the branches cut off and numbered, then it was bolted back together and artificial leaves wired on. Someone asked why they didn't just use CGI for something that's only visible for such a short time – the answer was that the shadows of individual leaves rustling in the wind can't be duplicated. We saw some of the remains of that tree, but it had been dismantled. – all the hobbit holes except for Bag End were only about a foot deep, so you never see anyone go beyond the doorway (I noticed that then later when we re-watched the movies, for example when Sam and Rosie enter their home at the end). We could all fit into Bag End, though, and Eric was kind enough to take anyone's photo who wanted it (see the top of my post – Alex said afterward, "Now we are truly geeks". Heh.). 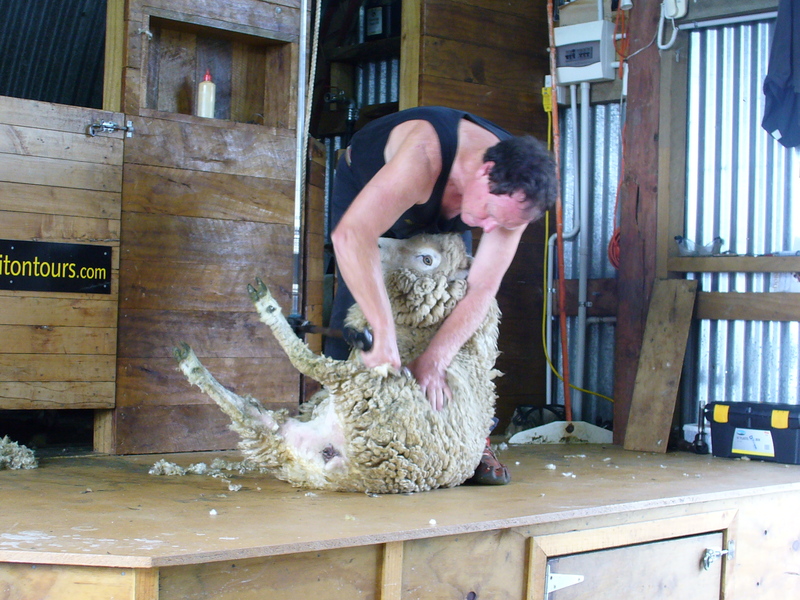 After the tour, we were all shown a demonstration of sheep shearing, which was pretty interesting, and then we were allowed to feed some lambs. 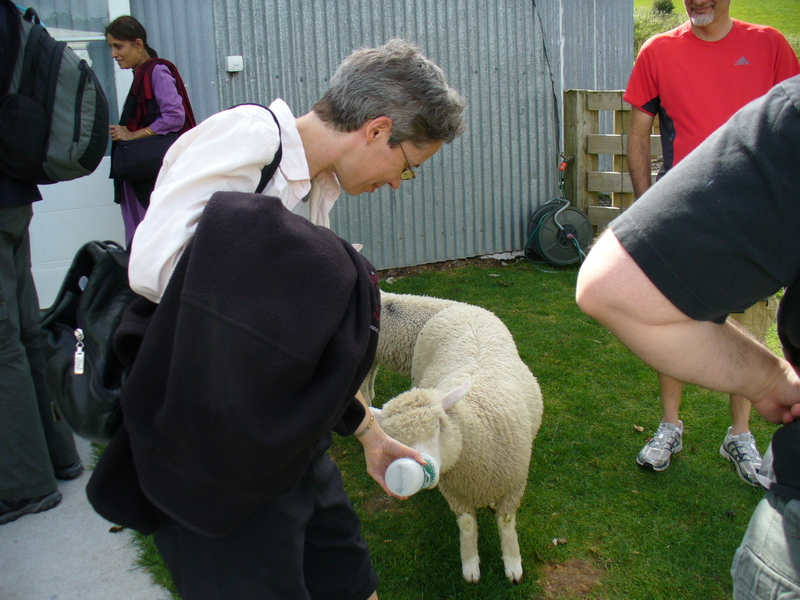 Kind of touristy, but, hey, I've never been on a real sheep farm, and we were in New Zealand, where the sheep still outnumber the people, so there you are. What a great hiding place (hobbit hole) wow, just stunning. Love the idea that the movie was filmed there. How funny about Hobbittown. A nature and culture walk indeed.